The Farmworker Rights Division of Georgia Legal Services filed a federal lawsuit on May 1, 2015, Cruz-Vasquez, et al. v. Sanders Farms, Inc., et al., United States District Court for the Southern District of Georgia, Civ. Act. No. 6:15-cv-48. We represented 9 H-2A workers who alleged violations of federal minimum wage law and breach of contract against Sanders Farms, Inc., Sanders Brothers, LLC and labor contractor Bartolo L. Hernandez. Another 6 H-2A workers joined the suit as Opt-In Plaintiffs. Before any responsive pleadings were filed, the parties reached a settlement in the amount of $39,500. The Sanders Defendants compensated Plaintiffs $30,000 in damages and paid $1,500 as attorneys’ fees. Plaintiffs received a total award of $7,500 from Defendant Hernandez who also paid an additional $500 in court costs. Also, the Sanders Defendants promised to offer Plaintiffs and Opt-In Plaintiffs employment through the fall of 2018 should their operations require hand-harvest labor, and Defendant Hernandez promised that neither he nor certain close relatives would recruit, hire, or supervise any H-2A workers through the fall of 2020. The parties petitioned the Court for approval of the settlement agreement, as required under the Fair Labor Standards Act and related caselaw. The Court approved the settlement on July 21, 2016. 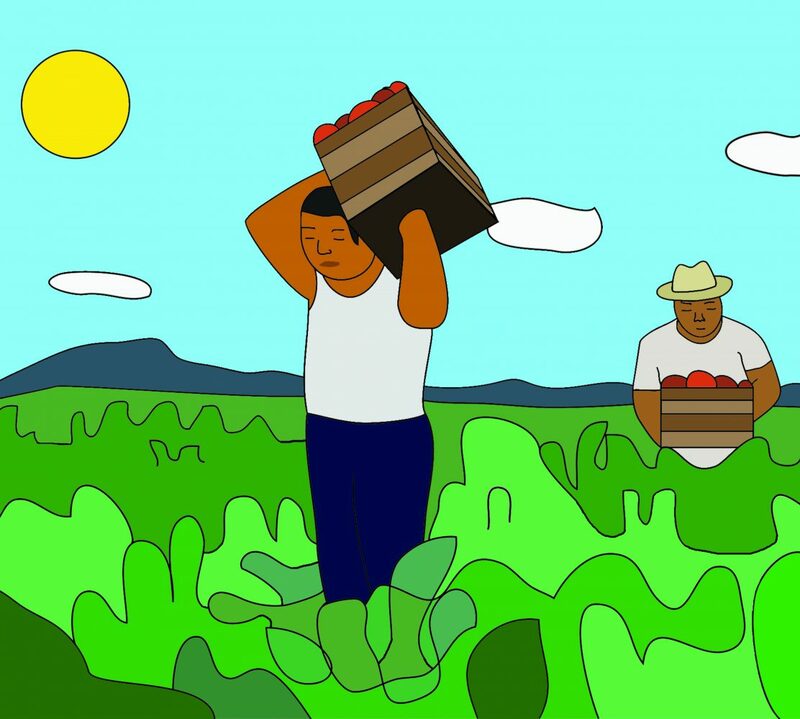 The Farmworker Rights Division of Georgia Legal Services filed a federal lawsuit on December 23, 2014, Ajiatas-Solval v. Cisco Produce, Inc., U.S. District Court for the Middle District of Georgia, Civ. Act. No. 1:14-cv-197. We represented 5 former H-2A workers who alleged violations of the Fair Labor Standards Act, the Trafficking Victims Protection Reauthorization Act, and the Civil Rights Act of 1964, against David Francisco-Baltazar, a former labor contractor and his corporate entity, Cisco Produce, Inc. The suit alleged a number of threats, recruitment, and wage violations meant to scare the workers into acceptance of substandard wages and working conditions. After being served, the Defendant filed for bankruptcy, triggering an automatic stay of the suit, but the Court subsequently lifted the stay. In the Fall of 2015, claims of contract violations against a blueberry grower and two corporate entities that allegedly participated in procuring the workers were amended into the complaint. Jamestown Blueberries, Inc., Van-Adams Blueberry Corp., and Jerry Vanerwegen of Homerville, GA settled the workers’ claims for $10,000. The Court granted a joint petition for dismissal of the remaining claims and counterclaims on July 19, 2016. ATLANTA – J&R Baker Farms, located in Norman Park, Ga., will pay $205,000 to settle a national origin and race discrimination lawsuit filed by the U.S. Equal Employment Opportunity Commission (EEOC), the agency announced today. EEOC filed suit on Aug.28, 2014, alleging that Baker Farms violated Title VII of the Civil Rights Act of 1964 when it subjected American and African-American workers to disparate terms and conditions of employment based on their national origin and/or race, including segregated buses, segregated work crews, and differences in production standards, work assignments, and other conditions of work. The complaint further alleged since at least the fall of 2010, Baker Farms engaged in a pattern or practice of unlawfully terminating qualified American and/or African-American workers and replacing them with foreign-born workers. Under the terms of the consent decree settling the case, Baker Farms will pay $205,000 to resolve the litigation which sought relief for 119 workers. In addition to awarding monetary relief, the consent decree requires Baker Farms to revise its hiring practices, offer equal opportunity training for employees, adopt and implement an anti-discrimination policy, and comply with reporting, monitoring, and notice posting provisions. The settlement also resolves claims brought by some of the individual workers who had intervened under 42 U.S.C. §1981 and under the Agricultural Workers Protection Act. “Employers have an obligation to provide a fair workplace, without discriminating against workers because of a worker’s national origin or race,” said Bernice Williams-Kimbrough, director of EEOC’s Atlanta District Office. Eliminating barriers in recruitment and hiring, especially class-based recruitment and hiring practices that discriminate against racial, ethnic and religious groups, older workers, women, and people with disabilities, is one of six national priorities identified by EEOC’s Strategic Enforcement Plan. EEOC is responsible for enforcing federal laws against employment discrimination. Further information is available at www.eeoc.gov. See the original press release online. GLSP Note: The Farmworker Rights Division of Georgia Legal Services represented 19 U.S. workers who were the charging parties in this suit by the Equal Employment Opportunity Commission, as well as 7 similarly-situated class members. GLSP intervened on our clients’ behalf and added claims for violation of the Agricultural Worker Protection Act. Una de las empresas agrícolas más grandes de Georgia ha acordado pagar $485,000 dólares para resolver una demanda federal en la que participaron unos 90 trabajadores agrícolas extranjeros y nacionales. La demanda en la corte federal para el Distrito Medio de Georgia afirmó que la agroindustria, basada en Norman Park, Southern Valley Fruit & Vegetable, Inc. Y Hamilton Growers, Inc., pagaron a los trabajadores agrícolas muy por debajo del salario mínimo, no pagaron horas extras y no les pagaron por todas las horas trabajadas.